This is a great antenna for a few reasons. These are some good reasons. Most of the players for the HUDSON VALLEY DF ASSOCIATION use this antenna. They work much better than the null antenna. 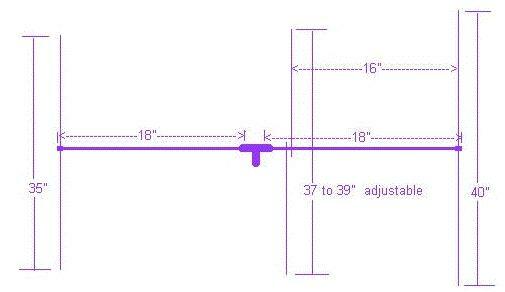 The construction of the antenna is really simple as you can see from the sketch above. My best record is about 50 minutes to cut, measure and assemble. The elements can be made of brass brazing rods or hobby rods. I have used the brazing rods and they work great. I used the 1/8" size for extra durability. The brazing rods are shorter than the needed 40" for the reflector. What you can do is use a but connector with some solder and then cover with some shrink tubing. The driven element should be spaced at about 1/4" apart. The solder point should be no more than 1/4" thru the other end of the boom. The director and the reflector should be mounted 1/4" from the end of the boom respectivly. The boom is made of schedule 40 PVC. 3/4" works well. When you drill for the elements on each 18" piece of boom, make sure you account for the space inside the T coupler. The picture above shows the antenna for vertical polarization. You can mount it horizontally if you like. Signal attenuation is tremendous when horizontally polarized if you are tracking a vertical signal. The driven element is tunable to whatever frequency you want to TX on. 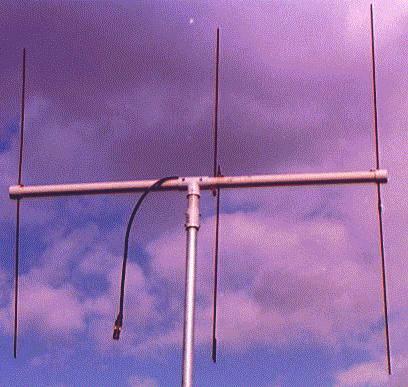 A simple and effective antenna thats worth building even if you want to use it for something else. I have even used it for packet in a quick fix. A little tuning and you in. Try it!!!! !